I know we’re only slightly past halfway throught the decade, but the way things are going, the petrol engines we know and love are starting to reach their twilight years. V12s are being swapped for V8’s, V8’s to 6’s and 6’s to 4’s and 3’s. In a time where manufacturers and bean counters are favouring utmost efficiency and low emissions, let’s take a step back and celebrate some of the best engines we’ve seen over the past 6 years, stretching back to 2010 thru 2016. Keep in mind, that ‘Best Engine’ does not mean the most powerful, but rather the ones with the most character and charisma. And no; no 2JZs or RB26s. You can go elsewhere for that. The Subaru EJ257 doesn’t count either since it was conceived 12-13 years ago despite being used today. The Voodoo V8 has to be my favourite engine of 2016 and among one of my favourites of all time. I never thought it’d ever get to this point. And it’s funny because I’ve lived most of my life in America, yet I’ve never really been one for the American performance cars. Fast forwards to 2016, and <i><b>WHAT THE HELL IS GOING ON?</i></b> I’m falling in love with the Mustang for crying out loud! This is a car that’s evolved so much in it’s 50+ years of production and now, it’s in its best iteration. 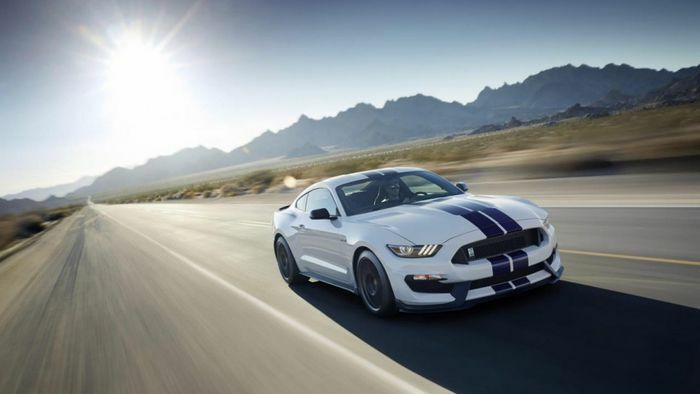 Most notable in GT350 and 350R flavours. And it’s not just the incredible handling and body control, it’s the engine alone that’s worth about half of the asking price. The Voodoo V8 has to be my favourite engine of 2016 and among one of my favourites of all time. The fact that Ford has decided not to go forced induction with this Shelby model also shows that even the guys behind the commonplace Mondeo/Fusion have the balls to have good fun and share it with the rest of us. The 8200 RPM redline isn’t just a boast, because the engine delivers power and torque consistently and linearly all the way to redline, so if anything this is an engine you’d love to beat the crap out of day in and day out. By design it’s a flat plane crankshaft, like you’d find in a Cosworth or Ferrari V8, yet they weren’t exactly able to get the same sort of sound. And it’s all thanks to packaging. Due to size complications, they weren’t able to fit two intake plenums, meaning they had to change the firing order and add counterweights to the crank to compensate. Plus, and like a Subaru Impreza STi, there’s an unequal length exhaust manifold, meaning it sounds a bit like a crossplane V8 Mustang. Either way, the complications with packaging and the engineers deciding to be practical and compensate made this indeed one of if not <b>THE</b> best engine of the past 6 years. Forget LS swapping; <b>THIS</b> is what needs to be swapped in to different cars. The closest you can get to a Formula One engine for the road. THERE'S F*CKING TRUMPETS ON THE TOP FOR CRYING OUT LOUD. Yes, we all know and love this engine from back in 2010; this is the very engine that went into the Lexus LFA, the firm’s first and so far only supercar. Despite being the only supercar they’ve made, it’s already a legend in its own right. The car had to be redeveloped after being deemed too heavy by the engineers, but the one thing that did stay was this jewel of an engine. A 72° 4.8 litre V10 revving to 9000 rpm. Not only was the car designed with mad OCD levels, but so was the engine powering it. 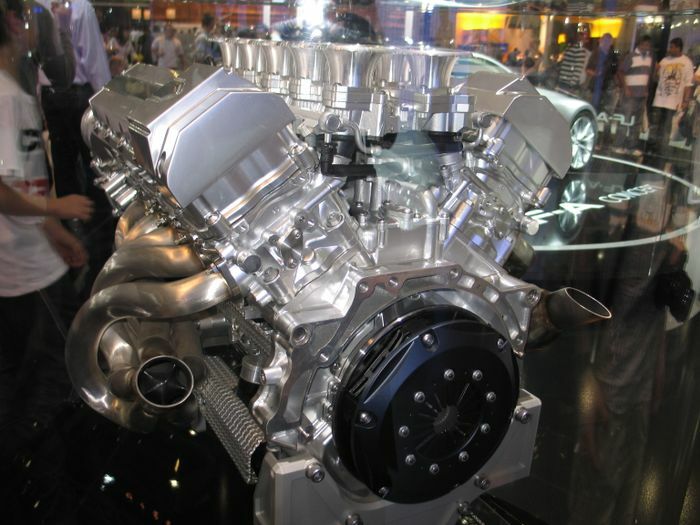 The engine was made from aluminium alloy, magnesium alloy and titanium alloy; combined with the small displacement, you had a V10 that was as small as a V8 and as light as a V6. The oil and water pumps had to be placed at the rear end of the engine to keep the weight distribution in check. They used titanium for the valves and the rocker arms have a diamond like coating and each cylinder <i>(look above)</i> has its own INDIVIDUALLY controlled electronic throttle body, this was at a time we thought individual throttle bodies were dead for modern cars . What’s more, keeping with Toyota tradition for top spec engines, they had the help of Yamaha to help tune the performance and the sound of the engine. What’s more that LCD rev counter front-and-centre isn’t just a gimmick, the lightweight engine revs from idle to redline so fast that an analogue rev counter couldn’t keep up with the way the engine gains and loses revs in addition to the mad throttle response. And <b>THAT</b> boys and girls is why it’s good to make your engines as light as possible. OK…this one might stir some controversy with the 911 purists, but with the announcement of the 991.2 Porsche 911 came the big news that all models (save the GT models) will be turbocharged <b>(u wot m8?)</b>. So what we have here is a 3.0 litre (down from 3.4 litres in the Carrera and 3.8 litres in the Carrera S) biturbo flat-6. All it is is essentially the previous N/A 9A1 3.4 and 3.8 litre engines with less displacement. However, despite the drop in displacement, there is more power thanks to the Bi-turbo set up, but most importantly more torque. With the older engine, there was a lack of torque at the low end meaning you really had to rev it out to actually use it, whereas in this newer powerplant, there is significantly more torque, however here it’s across almost the entire rev range, meaning that it’s even more usable than before. Now, purists argue that some of the soul of the base 911’s is gone with the turbocharging scheme. However look at it this way. Back 20 years ago, when the 996 was released, there was a huge fuss when the 911 went from air-cooled to water-cooled. 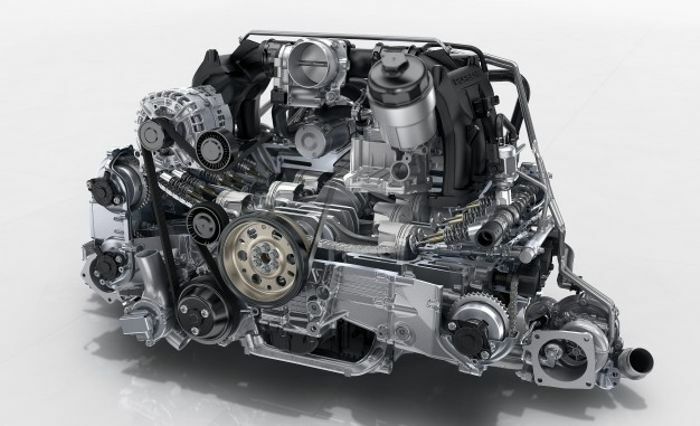 This is the same sort of deal; this is the first major change to the 911’s powerplant since the 996. There was a bit of skepticism as to whether the engine would sound as good as the previous 9A1, and, from personal experience, I can say it sounds almost as raw as the previous engine, yet with some turbo whistle added to it. And let’s face it, there’s nothing wrong with a bit of whistle. However I only got to hear the car, not actually get in and drive it. But from what I’ve read and seen online, the response once the turbos are fully spooled is near instantaneous and the engine pulls even stronger all the way through the rev range. So despite it being sacrilegious to the formula of a 911 Carrera, this engine deserves mad respect for being what is possibly the ideal turbocharged six-cylinder engine us petrolheads dream of. Low centre of gravity; mad response; great sound; efficient and just as powerful as we’d want it to be. Of course, you can’t leave out the best engines of the decades without bringing up Mercedes’ tuning arm, AMG. These are the master magicians behind the current Formula 1 W07 Hybrid, the now-legendary 6.2 litre engines that powered virtually all their cars in the previous generations. 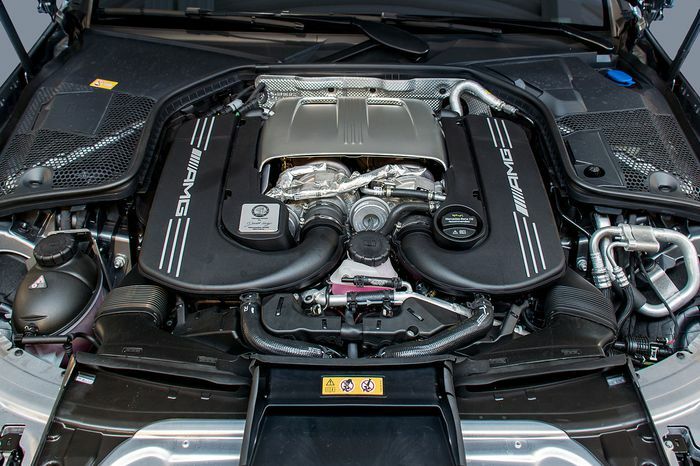 However, like Porsche, Mercedes-AMG decided the best way to deal with the evermore stringent efficiency regulations is to go towards forced induction. In comes the new 4-litre V8. What we have here is two AMG M133 turbo-fours (found in the CLA45 and A45 AMG) sewn together. Combined with a “Hot-Vee” turbo configuration, with the turbochargers sitting within the bank of the engine, you have a Bi-turbo V8 engine with virtually no lag whatsoever. 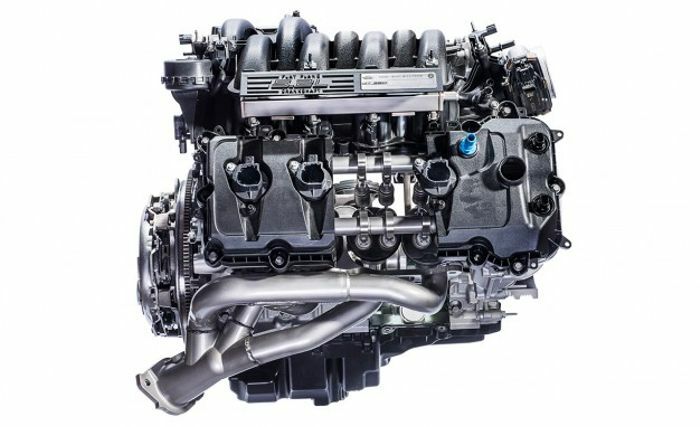 The power figures are quite impressive as well, this engine can be found in the G500 4x4, with 422 bhp and up to now has gone to 577 bhp in the recent AMG GT-R. And Mercedes claims that they can make even more power out of this thing, in which case: <b> BRING IT ON MERC!</b>What’s more, the emissions are down to what we would normally expect from turbocharged V6’s with efficiency close to the numbers I pull in my 2-litre Impreza WRX. And let’s not forget the noise out of this thing. Mercedes-AMG is most well known for the noises that their engines can make, like a baritone singer bleeding his heart out his mouth. And honestly, despite the bi-turbo setup, AMG’s back at it again with the mad vocals. Yes, I know these are two engines I’m talking about here, but really they’re the exact same engine. And whilst the Jaguar V8 has been continuously been developed, the current third-generation AJ133 came into play in 2010, so for that reason, it deserves a place on this list. Due for replacement by a rumoured BMW 4-litre powerplant within the next few years, the AJ133 and 126 are two of the very best examples of pure, muscular V8’s and V6’s that belt out vocals like Bono singing <i>“Moment of Surrender”</i> at Glastonbury. But it’s not just the noise that make these great engines. 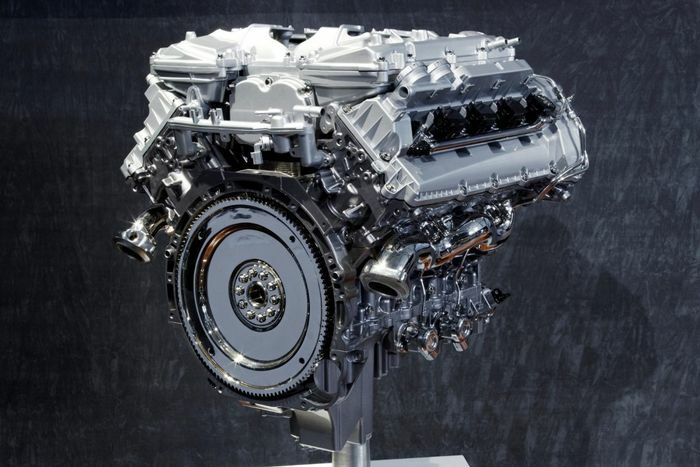 For a bit of background, the AJ126, 3-litre, 90° V6 is essentially the 5-litre AJ133 minus 2 cylinders found in virtually everything in Jaguar-Land Rover’s arsenal. Apart from the smaller Land Rovers, that is. Going into the current decade, Jaguar went with a newly developed direct injection system with variable intake and exhaust valve timing. Naturally Aspirated versions feature variable cam profile switching and variable track length inlet manifold. Whilst the supercharged versions feature the sixth-generation of Eaton’s Twin Vortex Supercharger. Making as little as 380 bhp in the naturally aspirated models and up to 570 bhp in its most powerful guise, found in the new F-Type SVR, the V8 feels as smooth as double-cream and pulls effortlessly even in something like the N/A version of the XK and has seamless torque throughout the rev range. It really is an engine you can use day to day. Despite ever increasing regulation, we’ve had some great engines to enjoy over the past few years and hopefully we’ll see some more to come within the next few before Greenpeace steps in and screws us all over. If there’s any other examples you think I may have missed, do feel free to leave in the thread below. See you guys in the next one; Peace.